When it comes to selecting new kitchen countertops, homeowners are increasingly discovering the benefits of CaesarStone quartz countertops. CaesarStone countertops possess all of the beauty and style of natural stone, but with improved durability. 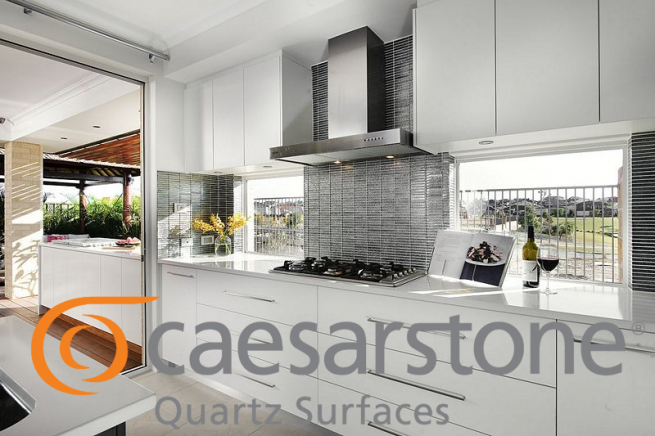 The biggest benefit of choosing quartz for your countertops is durability; CaesarStone is resistant to heat, chemicals, mold, mildew and scratching. In a comparison between granite and CaesarStone kitchen countertops, Portland residents will find that manufactured quartz is far less porous than granite, which means doesn’t stain as easily, never needs to be sealed and won’t be damaged by cleaning products. CaesarStone countertops also perform better than granite in impact and pressure tests, proving they’re less prone to cracking and breaking. Many different colors and styles are achievable with CaesarStone kitchen countertops. Portland homeowners can customize their countertops to match any décor style, from contemporary to traditional. Because they’re manufactured and therefore less prone to defects than other natural stone options, CaesarStone countertops come with a lifetime warranty on both the product and installation. Before you remodel your countertops, it’s a good idea to explore all of the options and compare the pros and cons of each one. While granite is still a trendy and prized material for kitchen countertops, Portland residents are discovering that CaesarStone has many advantages to offer, as well.